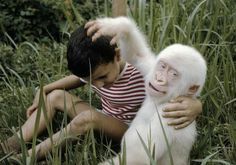 This's Snowflake, the only known albino gorilla, who now lives at a zoo in Spain. Incredible. why is snowflake in a zoo? No idea, but perhaps it was safer to have him/her in captivity in case the others attacked her. I know that other albino animals find it difficult to find mates.